A lot of my peers and clients don’t think of me as a people photographer. But ever since my son was born (he’s 24 now), and I was informed by my wife that I would be taking lots of photos of him, I’ve gotten to love working with people. Creating good people images is as much about their body language and facial expression as it is about lighting and post work, something I learned from paying attention to Peter Hurley. Peter has a great DVD and online training session on how to create dynamic “headshots”. The left image is pretty dull. Just a change in shoulder angle, a tilt of the body towards the camera, and attention to where the kicker and main light are falling makes a big difference. 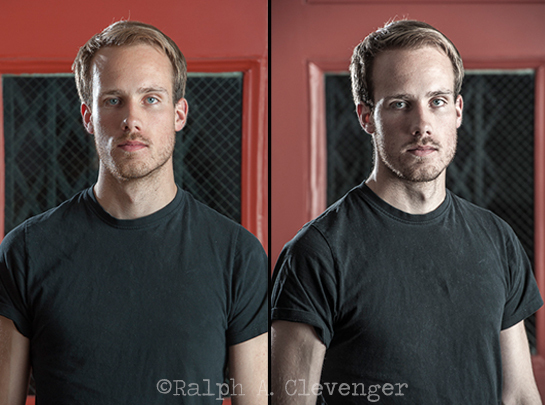 At the end of each semester at Brooks Institute I offer to photograph students in my Lighting Theory course. 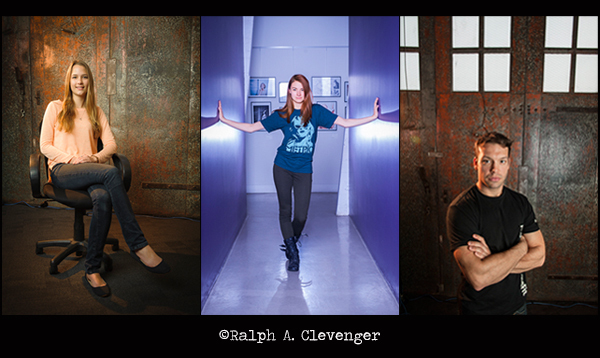 Using the Einstein E640 flash as my main light and a Nikon SB900 as my kicker flash, I’ll shoot the students in a couple of different poses. The “demo” shows them how quickly you can create different variations of a portrait. Photographed at the library and gallery on the Brooks Institute campus, Santa Barbara.